This construction worker costume is great for pretend play! 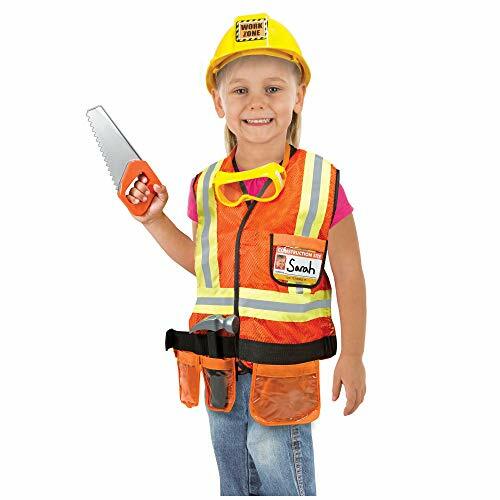 CONSTRUCTION WORKER ROLE-PLAY COSTUME: Your little construction worker will be ready for the job with this bright orange vest highlighted with reflective material and a tool belt, a yellow hard hat, and more. HIGH-QUALITY FABRICS: Our dress-up pretend-play construction worker set is made with high-quality fabrics and construction to ensure durability. The costume is machine-washable and features wipe-clean accessories. ALL THE ACCESSORIES: We've added goggles and a hammer, saw, and name tag for personalization. Our kids dress-up costumes are highly detailed and provide kids with loads of creative role-play excitement. GIFT FOR KIDS 3 TO 6: This play set makes a great gift for kids ages 3 to 6 years. Add the Melissa & Doug Police Officer Role-Play set to round out the pretend play experience and give kids another engaging option for screen-free fun.